Cruz, 19, is scheduled for formal arraignment Wednesday on a 34-count indictment, including 17 first-degree murder charges. The office of Broward County State Attorney Michael Satz filed the formal notice of its intentions Tuesday, though the action does not necessarily mean a plea deal will not be reached. “My reaction is as a parent of a deceased student, I expected that the state would have pulled the parents together to ask what we wanted and they didn’t,” he said. “If not allowed to do that tomorrow (at the hearing), out of respect for the victims’ families we will stand mute to the charges at the arraignment. We are not saying he is not guilty but we can’t plead guilty while death is still on the table,” Finkelstein said. 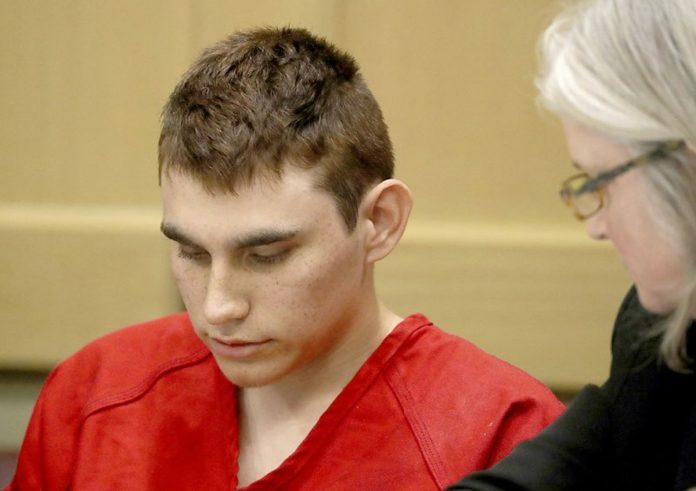 If Cruz does not enter a plea, a not guilty plea will likely be entered on his behalf by Broward Circuit Judge Elizabeth Scherer to keep the legal process moving along, his attorneys have said. In other developments, a student who is credited with saving the lives of 20 students by attempting to close and lock a classroom door during the attack was improving at a hospital. Anthony Borges, 15, was shot five times. Weeks after being shot, he fell critically ill of an intestinal infection. After surgeries, his condition was upgraded to fair. Meanwhile, Florida voters may get a chance to decide whether or not they want to approve new gun control restrictions. While Gov. Rick Scott just signed a new school safety and gun bill into law, the state’s Constitution Revision Commission may vote to place gun restrictions on this year’s ballot. The commission, a special panel that meets every 20 years, has the power to ask voters to approve changes to the state’s constitution. Tony Montalto, whose daughter was one of the 17 killed at Stoneman Douglas, asked commissioners at a public hearing Tuesday to put the proposals before voters. He said they need to act because the National Rifle Association has filed a lawsuit against the new law approved by the Legislature. “You can help defeat this challenge,” Montalto told commissioners. Shortly before the commission hearing in St. Petersburg, students from Tampa Bay area schools spoke passionately in favor of additional gun regulations, as did the father of a student who attends Marjory Stoneman Douglas.